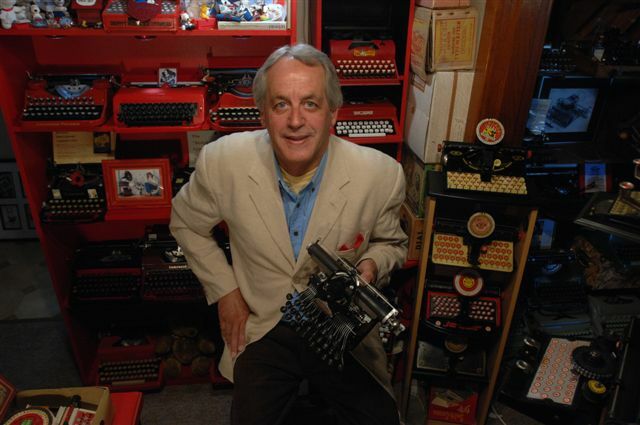 George C. Blickensderfer, inventor and head of the Blickensderfer Typewriting Company of Stamford, died this morning, shortly after 6, at his Sound Beach home. He had been seriously ill for some weeks with a complication originating with his predisposition to rheumatic troubles which finally resulted in endocarditus. Everything was done to relieve his sufferings but in vain. Only his strong vitality had kept him alive for some days. He was the third son of Mr and Mrs Nathan Blickensderfer of Western Ohio, and was born at Erie, Pennsylvania, in 1850. His widow, Mrs Katherine Blickensderfer, survives him. 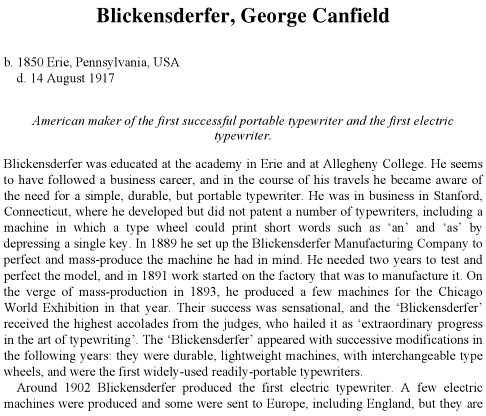 Educated in the public schools at Erie, Mr Blickensderfer entered the dry-goods business there upon leaving school. From his earliest days he showed an inventive disposition. At age 10 he attempted to build a flying machine that promised much for latter years. Mr Blickensderfer's first important invention was made in his early manhood, when he was still in the dry-goods business in Erie. It was a store carrier service for carrying packages and money from various counters of a store to a central station, where the package would be wrapped and the change returned. He perfected this invention, which was one of the earliest of the kind on the market, and organized a company in Erie to manufacture it. 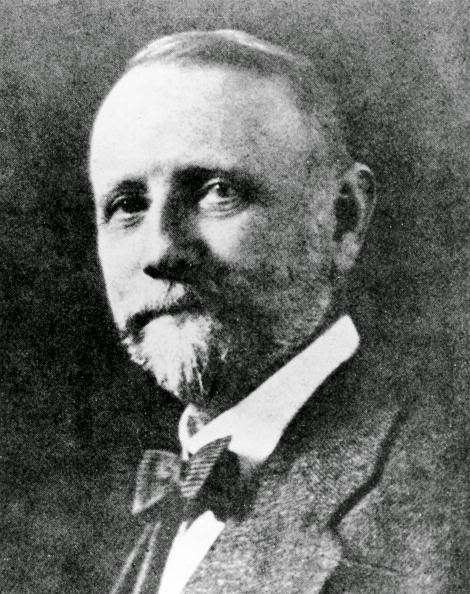 Later Mr Blickensderfer sold his rights in the patent to the Lampson Company. It was about 30 years ago that Mr Blickensderfer disposed of this invention and came to Stamford to live. He occupied the house at 88 Bedford Street, and in a little shop in the rear of the house, he brought out his first typewriting machine, which today is used in every civilized section of the globe and is, perhaps, the best known of any of the American typewriters abroad. 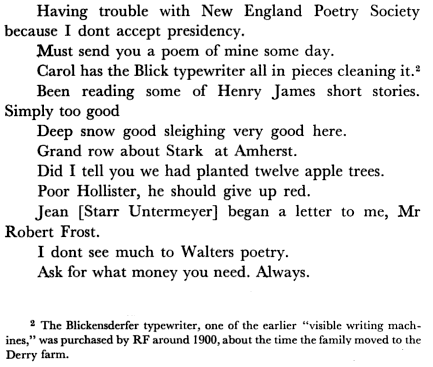 Mr Blickensderfer organized a company to manufacture and market the typewriter about 25 years ago. He was the head of the company until his death today. 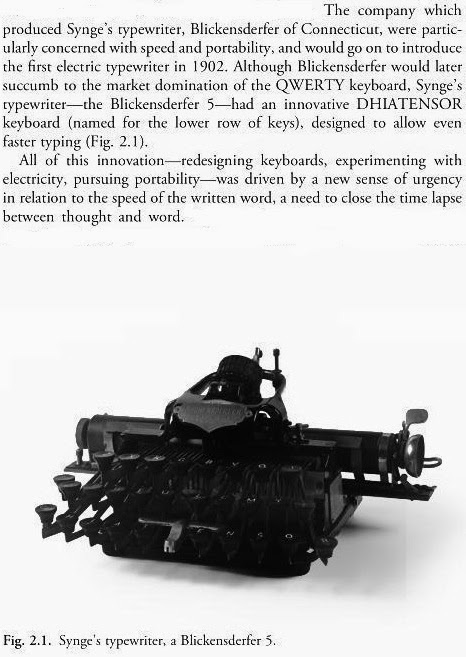 The Blickensderfer typewriter was a success from the beginning, its export business being especially heavy. 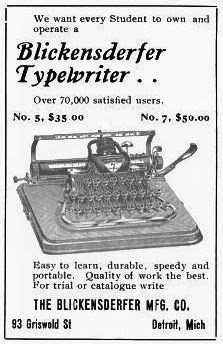 Some years ago, Mr. Blickensderfer brought out an electric typewriter which he perfected to a certain extent, but never put on the market. The intricacy of operation and other matters decided him not to attempt to market this machine, which was a marvel for speedy operation and other matters. 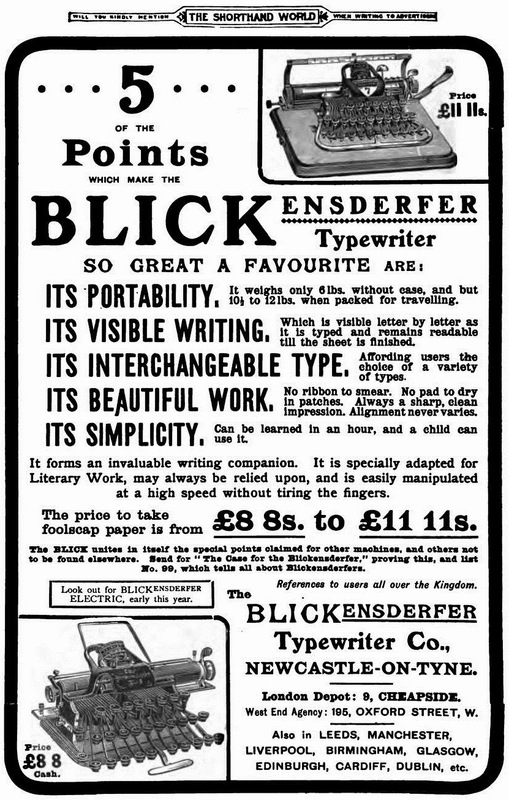 When the war broke in Europe, the Blickensderfer Company export business in typewriters and accessories was hit a hard blow. But the fertile mind of the head of the company was not long in finding a means of restoring the business that had been lost in this manner. He improved a belt-loading device by which cartridges are loaded mechanically into machine guns and it was so decided a success that the Blickensderfer plant has been busy ever since making it. The plant has been making the belts somewhat over a year, chiefly for the French government. Mr Blickensderfer improved the device from time to time, and representatives of the French government have been here frequently to witness tests of the improved article. Just before his last illness, Mr. Blickensderfer completed the invention of a new mount for machine guns, a tripod which would facilitate the use of the guns wonderfully. He had not put this invention on the market, but it was known here that he was negotiating with representatives of this and foreign governments with the view to its adoption by them. The Blickensderfer Typewriter Company began business here in a factory in Garden Street. In 1896-97 the company erected its own plant in Atlantic Street. Mr Blickensderfer's intense thought on his later inventions resulted in injury to his nervous system, which possibly hastened the end. Mr Blickensderfer was twice married. First to Miss Nellie I. Smith, daughter of Mr and Mrs. Hervey Smith of Erie, Pennsylvania. She died in 1915. Some months after her death, he was fortunate enough to meet the lady who became his second wife, Miss Katherine Cochran, whom he married in September of last year. To the faithful and unceasing devotion of this wife, the prolongation of his life was undoubtedly due of late, for his nervous system had been shattered badly by an accident in which he fractured his hip a few years ago. Beside this lady, to whom all sympathy will go out, Mr Blickensderfer leaves his brother, William J. Blickensderfer of this city, two brothers and two sisters, Mrs Jordan and Mrs Willson, residing in the West. For twenty years William J. Blickensderfer has been his brother's other self and inseparable companion, supplying the calmer after-thought, the careful judgement to his brother's more impetuous genius. The Blickensderfer factory, while employing a comparatively small force, as factories now go, has been remarkable for the morale of its employees. Strikes have been unknown and the kindly feeling of a united family has been remarked by outsiders. Though a busy man and a hard worker, and gifted with the power of intense concentration, Mr Blickensderfer liked relaxation. One of his favorite methods of gaining it was in the wilds of Canada, fishing and hunting. He had a membership in a fish and hunt club there. He also engaged in sailing the waters of the Atlantic and was an accomplished yachtsman. Funeral service will be held at his late residence, Sound Beach, on Friday at 3pm. Interment will be at Woodland Cemetery, Stamford. Nice collection of Blicks. I'd love to find just one that was in good condition that I could afford. I really enjoyed this post. As often happens I learned quite a bit that I did not know before.